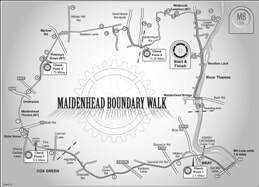 The route follows the old boundaries of Maidenhead town and is approximately 13 miles in distance, starting and finishing at Boulters Lock car park. But don't worry if you don't/can't walk the full 13 miles then a shorter route is also available. From Boulters Lock you'll walk along the side of the Thames towards Bray where, weather permitting, you'll get to enjoy a river crossing, which is great fun on a sunny day. From Bray the route will take you through Cox Green, near the Shire Horse Pub on The A4 and up towards Pinkney's Green. Crossing the north-side of town you will follow the route towards Switchback Road North, cross the railway line and up towards Wildbrook Common. At Lower Cookham you will rejoin the river route back to Boulters Lock. The route itself is very idyllic, taking in some of the best parts of town. You can event spot the old boundary stones that still mark the route today. Also, remember to take the time to enjoy the wildlife and many varieties of trees and plants on your walk. For our younger walkers, see how many boundary stones you can find and tell us how many and where you saw them. The route, is marshalled for your security, with various check points so we can ensure that everyone is safe and having fun. To download the route map, please click here.